Home Made Tofu - mmm-yoso!!! For some reason, about a month ago, I became obsessed with trying to make tofu at home. When I mentioned this to the Missus, she just asked me, "Why"? Good question, I really didn't know why. So I looked over a few tofu making recipes in books I own, and looked over some online resources like this one. They were all a bit different, and many of the recipes used vinegar, and or lemon juice, which I decided not to use. So basically the recipe had three ingredients, soy beans, nigari, and water. 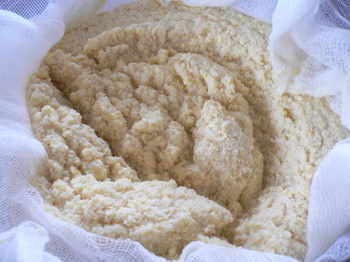 Nigari is the coagulating agent used to make tofu. 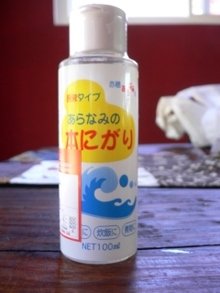 Nigari (literally "bitter" in Japanese) is mainly Magnesium Chloride and a few other minerals. 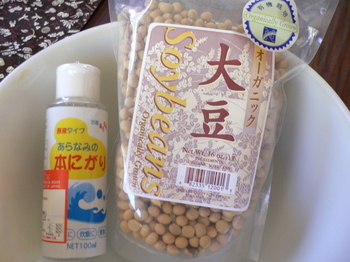 I purchased the bottle of Nigari, and the Organic Soybeans from Nijiya, and had them sitting around for a few weeks. Finally, one weekend afternoon I decided to finally try and make tofu. 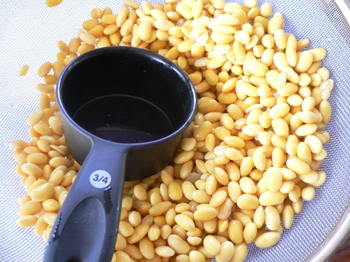 I first placed 2 cups of soybeans in a bowl and completely covered with water. I soaked the bean overnight in the frig. The next morning I brought a pot of water to a boil, and drained the soybeans. I poured 3/4 f a cups into the blender and covered with 1 1/2 cups of boiling water and blended into a finely. I poured this slurry into a pot, and repeated the process until I had processed all the soy beans. I brought the pot to a boil, than reduced to a simmer stirring constantly. I let this liquid simmer for 20 minutes, stirring occasionally. After 20 minutes I strained this liquid through a cheesecloth lined colander. 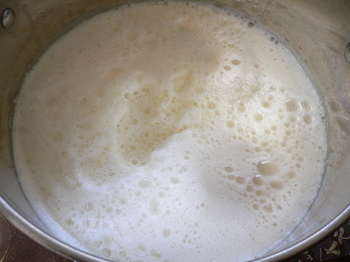 I drained the cheesecloth and set aside the pulp, also known as Okara, the very nutritious pulp. The Missus enjoyed a simple stir fry of okara and green onions. What remained was the soy milk. I divided the soy milk into two portions; half for tofu, the other half for the Missus's drinking pleasure. I poured the tofu potion into a pot, and brought it up to about 160 degrees F, and removed it from the heat. Because I wanted a rather firm tofu I added 4 teaspoons of Nigari while stirring the soy milk. 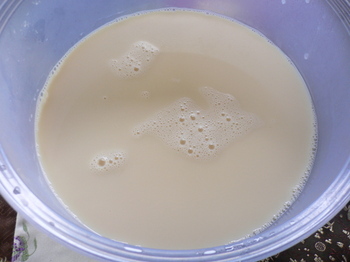 I than stirred the soy milk in a figure 8 pattern briefly, covered the pot and let sit for 5 minutes. After the 5 minutes were up, I checked for "curd-age", and ended up adding another 2 teaspoons nigari, and covered the pot for another 5 minutes. Satisfied with the amount of curds, using a soup ladle, I strained the liquid through a cheesecloth lined colander(I don't have a tofu box). 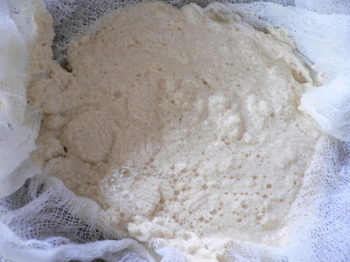 I folded the cheesecloth over the curds, and placed some weights on the curds, and let the whey drain out for 15 minutes. Because I enjoy my tofu cold, and placed the tofu "dome" in a container of water, and chilled for an hour. After which I enjoyed the fruits of my labor. Holy son of a man!!! You made homemade tofu!!!!!! You are a rock star / Greek god / the President of the United States Kirk!! I am in utter awe!! How funny Jo and I were just talking about this because she can't find soft tofu anywhere! I will have to sned her some Nigari, but she might try the lemon addition. Wow! Cheers to you! Making your own tofu, now that's something I call impressive. I feel like you should get an award or something! I also give you credit for having the willpower to not drink all the soymilk - I don't think that the milk would have lasted till the tofu stage in my case! :) But oh man, good work!!! Btw, how do you make silken tofu? "I've gained a measure of appreciation for that humble block of tofu....."
looks yummy! ranch99 sells automatic soy milk machines, but i don't think it makes as good soy milk or tofu than your method. you can also use calcium salts to denature and coagulate the soy protein -- thereby increasing calcium intake and keeping your bones healthy. Is there any significant difference from using gypsum instead of nigari? Here's to you Kirk, and so when will you be making your own noodles? Forgive me if you've already done this...does anyone do this? would the Pho taste better...just kind of meditating on that pasta machine in the closet. It was a wedding present. I have never made tofu myself, but I've always been charmed that my 1975 edition of "Joy of Cooking", of all things, has instructions on how to do it. This is one of many reasons why I still love this book even if a lot of the recipes are dated; it's so encyclopedic that it also has instructions on making cheese from scratch, skinning wild game, boning fish, canning, and on and on and on. 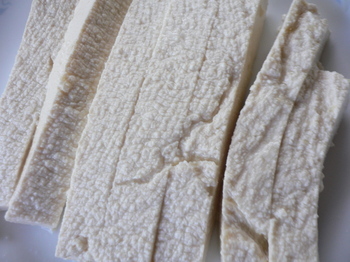 Home-made tofu. I never would have considered it if you hadn't brought it up. What an awesome idea! By Neptune's Trident, PE! Such hyperbole.... LOL! I'm glad to provide some entertainment. Hi Mills - I've heard that many "Health Food" stores sell coagulant for tofu, so maybe she can check there. Hi Jean - Try a health food store and ask for coagulant to make tofu. Or you can try one of the suggestions below. I had thought that silken tofu was made by just controlling coagulant and water....but here's something that might interest you! The way you cook, you'll have it wired in a jiffy! Hi Jack - Thanks man! Hi Liverbomb - Half the tofu recipes on the internet start with a Soy Milk Machine. I was going to start with Organic Soy Milk from the market...but the Missus told me, since I was going through all the trouble, I might as well start from scratch. BTW, have you tried Chin's yet for breakfast - I think you'll like it. Hi Ed - Calcium Sulfate(gypsum) can also be used as a coagulant -but make sure you use food grade, not industrial grade Calcium Sulfate. I also read that when used well, 16oz of Nigari can make up to 250lbs of tofu, whereas 16oz of gypsum can make about 120lbs. Hi Emily - I'll wait until my Mother In Law is back in town for home made noodles. Hi mizducky - I read something on the internet where someone for a class project made tofu from Epson Salt, so I'm not surprised. Hi CP - Just getting back to my roots, I guess. BTW, you may just want to do the Soy Milk part - 2 cups of soy beans made almost 3 quarts of milk, which the Missus said tasted better than what you buy. Great post. This brings back memories of when I was growing up in Ohio. There was no place to buy tofu so my mom with her ingenuity made it. I recall the soybeans were in a big wooden box and that my mom would do the same steps you did. I didn't know where she got the magnesium chloride but I do recall the soymilk. I wasn't as appreciative of the taste then as I am now. I even recall us lugging that big box of soybeans from Ohio to California when we moved over. sorry for another post but I recall there was a really famous woman doctor of Japanese ancestry who was trying to get people to eat soy protein and tofu before the 1930's. She extolled the virtues of the lowly bean and even had everyone from the president to others seriously considering this vegetable protein. I think she was from Hawaii. Dang, I can't remember her name.